You must be a member of the Berlin New in Town Group to attend this activity. Would you like to join this group? I hope you had a great start of the year ! 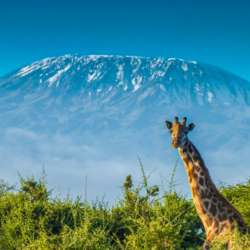 I'm planning a group journey to climb Mount Kilimanjaro between September and October this year. This is a journey of a lifetime to reach the highest summit in Africa and the 4th highest mountains in the seven continents. If conquering one of theses summits is on your bucket list, then now is the right time, as the changing climate patterns and global warming will make climbing a much more difficult challenge over the next ten years. I got in touch with two of the travelling (trekking) agencies that organize the Kilimanjaro hike and I'd like to share the details with you if you are interested in joining us. This will be the first organization meeting (brunch), there is a lot to prepare and discuss before we book the trips (What to bring, weather and best times for to climb, routes of Kilimanjaro, how to prepare your body for this journey, parks visits, Safari and wildlife viewing in Tanzania, ..... etc). We will discuss all these points through two or three other meetings and my goal is to get confirmations and book the trip before May.